Disasterous. Unheard of. Over 500 earthquakes over 3 days, with the largest being 7.3 M… Of course there were buildings collapsed, roads destroyed, gas pipes broken, and damage that one wolud expect. the rescue workers could hear her faint cries.. There are lots of tragedies that accompany natural disasters but there is one that people tend not to think of. 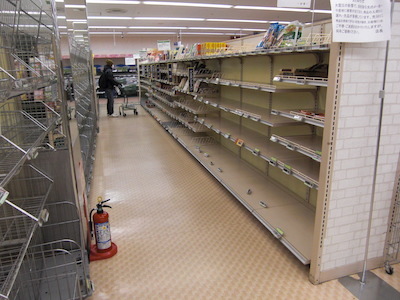 Notice the picture of empty shelves in a supermarket in Japan after the earthquake…. Any products on hand during a disaster will be scooped up and the shelves gleaned moments after leaving the local residents in a dangerous state. Your average house has enough food on hand for 3 days, often less in Japan… With empty shelves in the house and in the 7/11 on the corner what are people to do? There are 2 important things that we should do to prepare for such occurances. 1. Keep at least one weeks water and food on hand in your residence. Keep it fresh and safe because it's too late to go back once you need it. 2. Support local groups like Kozmoz. During a disaster, your community members are people that you can count on. However, once disaster strikes, just like the local supermarket, the shelves in the Kozmoz Food Bank Warehouse are soon bare, but the stocks that with your help they set aside for such disasters may very well save the lives of those you love. The people in Kumamoto need assistance today, and Kozmoz is sending aid. Please donate. You can find information on how to donate on our disaster support page.